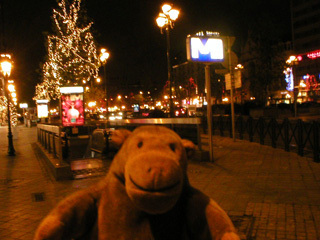 "It's probably better during the daytime"
Mr Monkey caught the metro to Louise, and scampered up into one of Brussels' most fashionable shopping streets. As it was late, the shops were shut and Mr Monkey had somewhere else to go, so he ran down the road to the Place Poelaert. 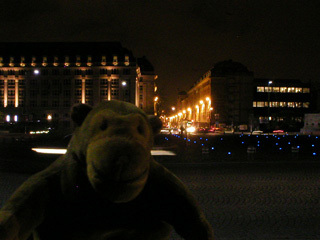 This was built as part of the construction of the Palais de Justice*, and Mr Monkey was fascinated by the little blue lights set into the paving. * Which isn't in the picture because all the lights were off.